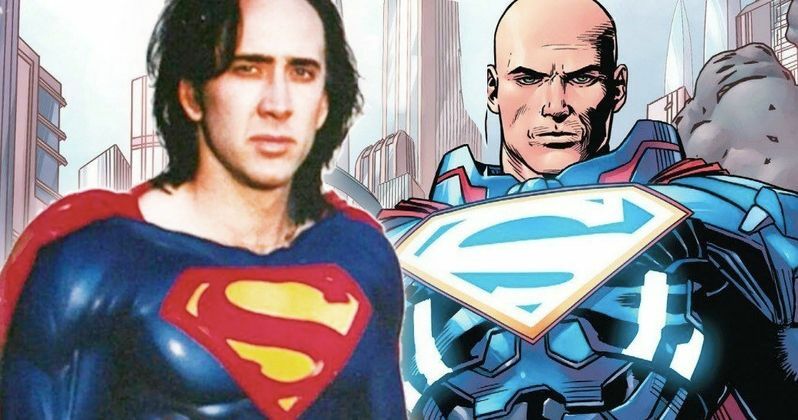 Nicolas Cage was originally attached to star as Superman in the 1990s, but the project never made it off of the ground. The actor believes that the ship has since sailed on playing the Man of Steel, but thinks that he'd make a "great" Lex Luthor, and is excited by the idea of playing the villain. Cage is currently out promoting his latest movie, Mandy, which has been getting rave reviews, with most critics praising Cage's intense performance in the revenge thriller. In a new interview, Nicolas Cage was asked if he knew about the online petitions trying to get him to play Superman. He laughed and said, "Oh, I think my Superman days are long gone," patting his belly at the same time. However, the interviewer asked about the possibility of taking on the role of a villain, which got Cage excited. He said, "Oh, that would be great! I'd make a great Lex Luthor!" While there's obviously no role for him at the moment, Cage would make for a pretty awesome Lex Luthor, or any comic book villain for that matter. Nicolas Cage's recent role in Mandy could open up some new doors for the actor, which could include a role with Marvel or DC in the near future. Cage's unique acting style has been criticized over the years and even turned into the popular Cage Rage meme, which the actor is not very happy about. When addressing the meme, he believes that it hurts the movies that he's in, and says that he finds it annoying because he throws everything he has into his roles. Whatever the case may be, Cage's style of acting would make for a great villain in a superhero movie. In other parts of the interview, it's revealed that Nicolas Cage had to audition for the Coen Brothers' 1987 classic Raising Arizona 20 times before he landed the part. The directing duo were unsure of his abilities, which Cage believes helped sculpt him into the actor that he is today. The actor has been called difficult to work with by a number of co-stars and directors over the years, but it seems that everything has pretty much worked out for him in terms of carving out his own niche in the entertainment industry. When addressing his intense performance in Mandy, Nicolas Cage says that his marriage of 14 years had ended unexpectedly, so he threw all of his emotion into the movie. Cage used the film as a form of therapy, which has been called one of his best performances in decades. Let's hope that the actor can channel some of that emotion into an upcoming superhero film where he plays a villain. You can read the rest of the lengthy interview with Nicolas Cage and his plans to play Lex Luthor over at The Guardian.